This product range is designed specially for swimming reason. They are longer than the regular towel and can play as substitute of attire. 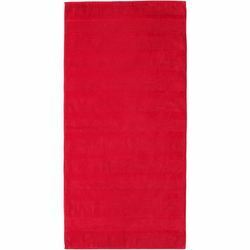 We offer these towels in bulk quantity at reasonable price. We are instrumental in offering Jacquard Beach Towels to our clients. High grade fabrics and yarns are immensely utilized by the professionals of our firm in designing these towels. All our towels are provided by us in a various designs, shapes, sizes and colors to suit the demands of clients. - MOQ- one 20' container - Upto Ten assorted designs. 9.00 LBS PER DOZEN / 300 GSM QUALITY MADE ON POWERLOOMS - TOWELS ROUNDED AND WRAPPED IN BELLY BANDS AND LOADED ON PALLETTE FOR EASY SHOPPING . Vibrant patterns with beautiful double jacquard borders. Jacquard Towels are towels made from colored yarns for weaving the pattern into a towel. Our towels are made with top notch quality micro modal or cotton and have a classic jacquard pattern with monogramming available on fluffy towels. Designs can be woven directly into towel for lasting impression and high end look. 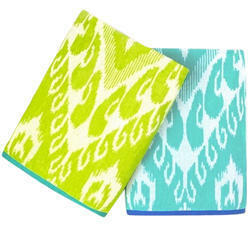 These towels are offered in fingertip, beach, hand and bath towel sizes. we are manufacturing and exporting a wide range of optimum quality Cotton Jacquard Beach Terry Towels. Our professionals have manufactured these terry towels using high quality cotton jacquard fabric, which is sourced from the authorized vendors of the market. The offered range of terry towels is highly appreciated among the patrons for their attractive designs. You can experience the softness of your quilt with our beach towels. Available in bright colours and contemporary designs. A Large selection of most wanted style & patterns, These towels are sure to make an impression by any poolside & Pamper your own being. Printed Jacquard Beach Towels, Size: 30"x60"
We are a foremost organization, actively occupied in providing a wide range of Jacquard Beach Towel. We accept bulk orders for these Jacquard Beach Towels and ensure their delivery within the stipulated time-frame. Ss. Home Linen Pvt Ltd. Features: Towels of sulzer rapier terry looms with electronic jacquard Towels available in 10-15 assorted designs per order/shipment Designs/towels as per buyers' specifications are welcome Production undertaken by highly qualified and experienced team. Consistency in quality of towels is assured.